I hope you have been enjoying the previews, its day three and I have been loving them! This is 'Pirate Henry', don't you love how casual he looks with his board shorts? 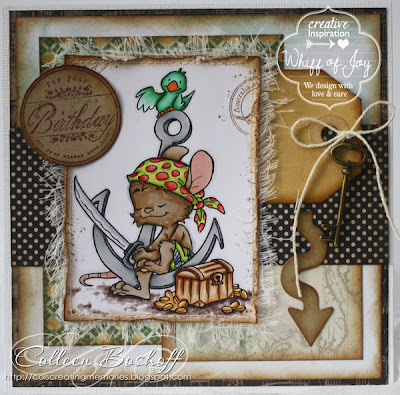 I used Basic Greys 'Serenade' papers, WOJ 'Festive Occasions' sentiment stamp, WOJ charm 'Baroque Keys', WOJ Die-lights 'Arrows', some muslin for texture and the tag and twine is from my stash. Thank you for stopping by and for your lovely comments, don't forget WOJ's blog hop on the 11th April. So warm and cozy feeling if a pirate can be any of that. hee hee Very cute. 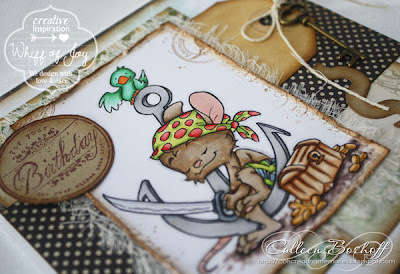 A wonderfull pirate card creation, looks great!